When we move beyond ‘safety’ and meet at the ‘point of suffering’, we can walk together towards true peace for all, and not just ‘security’ and ‘safety’ for ourselves. When we recognize that there will be no safety without peace, we will be able to find new solutions and ways to create peace for all and not just for a few. In order to move toward building sustainable tourism that is reliable and inclusive in all aspects and contributes to sustainable development, peaceful and inclusive societies and access to justice for all, we will need to seek the path of peace for all, a path where justice and peace will be embraced. SDG 16 is more than ever close to the vision of inclusive and universal tourism, a peaceful tourism that strives for justice. The United Nations World Tourism Organization (UNWTO) declared its motto ‘Tourism for All’ for World Tourism Day in 2016, placing emphasis on inclusiveness and equal rights of all people to enjoy the benefits that tourism can bring. At the same time, the world is witnessing large numbers of refugees who risk their lives to cross borders and even end up shipwrecked on their way. People in Syria, Iraq, Afghanistan, and Somalia have lost the foundation of their lives to war and violence. These refugees are not part of the ‘tourists’ who have the right kinds of passports, issued by rich countries, that allow their citizens to travel the world in planes and on cruises for leisure purposes. Paris, Brussels, Istanbul, Berlin – this no longer reads like a wish list of places to visit. It is a list of popular urban tourist destinations attacked by terrorists in 2016. Carlos Vogeler, executive director at the UNWTO, remarked that terror attacks are occurring in places that were never expected; nowhere in the world feels safe anymore. The locations of the attacks were places such as airports, markets, capitals, and famous tourist sites, which may make any tourist think they might also be a victim. The World Travel and Tourism Council (WTTC) reported that people are choosing to travel to destinations based on perceptions of safety and that 20 percent of the tourists are changing their travel plans due to safety concerns (AP Korea, 2016). Most of the people who enjoy the privilege of travel used to perceive wars as something happening in somewhat distant places. However, terrorist attacks affect us in our daily domains and refugees have become our neighbours. We may change our travel plans to avoid danger, but we may find it difficult to avoid the anxiety in our daily lives. If ‘safety’ is not guaranteed for tourists who cross borders, tourism itself as an activity will be threatened to the core. Yet, is the ‘safety’ that we are so strongly wishing to protect only achievable through control and exclusion in the name of ‘security’? The United States which has experienced terror attacks in the centre of New York City, has compulsively strengthened airport security. Countries such as Israel, Russia and Turkey strictly control the movement of peace activists and travellers. In recent years, we have realized that greater suspicion and strengthened security procedures are not the answer for reaching our desired ‘safe societies’. 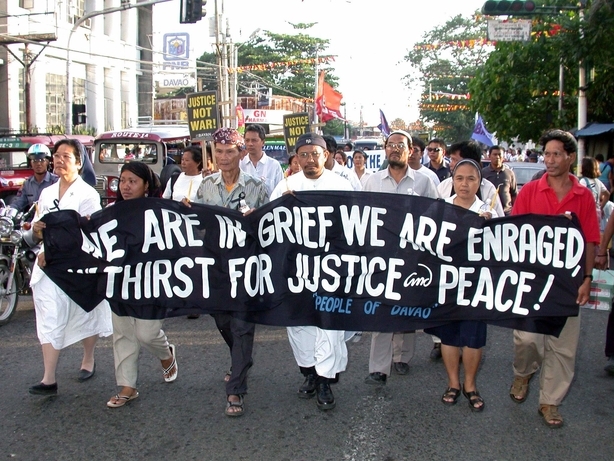 If we search for solutions to attain world peace that is currently threatened without acknowledging ‘peace for all, strongly based on justice and human rights’ and if we concentrate on a kind of security that only serves to protect certain individuals and groups, that will only result in greater violence, exclusion, discrimination, and repression. Tourism is not a just personal activity, it is embedded in a political and social context. When tourists cross borders and meet people, they may become witnesses of hidden situations. Some governments want to control what tourists actually get to see and how they may perceive it. They try to control tourists’ pathways for political reasons. In 2016, Israel has been criticized for deleting Palestinian key historic sites from the tourist map. It has instead created and distributed a biased tourist map marked with information on Israeli synagogues and settlements. This indicates Israel’s tenacious and systematic effort to omit Palestine from the realm of tourism. The numbers of tourists who set out to travel to the ‘Holy Land’ add up to 1.3 million per year. This is not only a major opportunity for Israel, but also for Palestine which is facing a 26 percent unemployment rate. In 2013 the number of tourists who visited Palestine was 600,000 (PBS, 2014), and among those people, 66 percent headed to the West Bank where the most visited city of Bethlehem is located. Most of these tourists visit Bethlehem by bus tours organised by Israeli travel agencies. They visit the site for only about two hours, briefly scanning a few major churches including the one where Jesus was born. The Israeli government allows Israeli tour buses to freely cross over to the West Bank, but on the contrary prohibits the entrance of Palestinian tour buses (Schlomka, n.d.), who wish to simply pick up tourists, for ‘security’ reasons. Before tourists are taken to Bethlehem, they are strictly educated on the dangers of Palestine and are prompted to end the tour quickly within two hours. After the short tour the bus returns to ‘safe’ Israel. Rami Kassis from the Alternative Tourism Group (ATG) attests how this biased information is affecting Palestine’s tourism: “The revenue Palestinians get from tourism may be about three percent. The rest goes to Israeli coffers” (Tobassi in ATG, 2008). In occupied territories, tourism is easily used and misused by occupying nations as a tool in a structured system of occupation. Tibet, which has been occupied by China since 1950, started to be opened up to tourism in August, 2006, when the Qinghai–Tibet Railway was opened. The annual number of tourists which had been 1.2 million before reached over four million in 2007. The Chinese government made great efforts to accelerate the development of tourism in Tibet by constructing infrastructure, with the Chinese in a far more dominant position than the Tibetans. It also gave generous support related to housing and business for the Chinese who chose to migrate to Tibet. Native Tibetans, who were originally nomads, were persuaded to give away their fields for hotels and lost their traditional markets and streets to shopping centres for the price of next to nothing. The Chinese government previously tried to oppress Tibet’s culture and religion, burning down thousands of Tibetan temples. Now it has begun its disneyfication of Tibet after realizing that Tibetan culture and religion have great potential as tourist products. The traditional Tibetan ‘sky burial’, once banned by the Chinese government, has been turned into a cheap five-dollar tourist attraction (Tibetan Guide, 2008). The Jokhang temple, which is the final destination for prostrating Tibetan pilgrims, started to attract large crowds of tourists photographing the pilgrims. Tibetans are losing ground amid the disneyfication of Potala Palace, temples and most of all, the lives of Tibetans – driven by Chinese capital. Eventually Tibetans who could no longer tolerate to this severe suffering are burning themselves to death as a protest, as a cry of help to the world (Sydenstricker, 2008). The Chinese government even attempted to prevent travellers from sharing this cry of death with the world. Tourists may currently visit Tibet only in groups accompanied by tour guides. Tourism hardly ever plays a neutral role in conflict situations and might even fuel war and conflict, for example over resources, and social injustice. There is a need to find ways and means to make tourism a tool for peace, not for fuelling conflict. The Palestinian Alternative Travel Group (ATG) has been fighting for justice in tourism. They say: “What we want is not simply ‘economic contribution’ by tourists but social justice. Tourism is a precious opportunity for a region to obtain economic gains, but would money have any significance if there is no justice? When the money earned in tourism stays in the region, prevents polarization by taking care of people in need, and is used to support social justice, wouldn’t this be a true form of alternative tourism?” (Jamud, 2009). In post-conflict settings, tourism often experiences a quick boom – after 26 years of conflict in Sri Lanka, for instance, and after the dictatorship in Myanmar. Rapid development, however, may fuel still latent conflicts. Governments may be tempted to promote tourism even before having initiated a process of reconciliation and recovery. Ecological and social standards may be ignored, and the rights of local people violated (Roundtable on Human Rights and Tourism, 2016). In their reports “Dark Clouds over the Sunshine Paradise” and “Under the Military’s Shadow”, the Society for Threatened Peoples (STP), Switzerland, and the National Fisheries Solidarity Movement (NAFSO), Sri Lanka, reviewed the situation of local communities in the face of tourism development with a strong influence by the military. The military presence in Sri Lanka has not reduced since the end of the war. Military expenditure has increased continuously during recent years. The military is focusing this increased budget more and more on tourism with the army, navy and air force opening hotels all over the country and increasingly offering tourist activities. The provision of tourism opportunities by the military is problematic not least because it deprives the local population of an important source of income. The STP and NAFSO urge the Government of Sri Lanka to reduce the military presence, to cease the surveillance of local population and order the military to end all of their commercial activities. Society for Threatened Peoples (2015): “Dark Clouds over the Sunshine Paradise. Tourism and Human Rights in Sri Lanka”. In fragile post-conflict situations, tour operators are faced with the challenge of human rights related responsibility. They risk becoming ‘partners in crime’ when human rights are violated, or may contribute to aggravating conflicts. In order to assess the impact of business operations on human rights in a post-conflict area, both the conflict and the current situation need to be carefully analysed. The Roundtable on Human Rights and Tourism has issued recommendations to assist product and communications managers in implementing human rights related due diligence in fragile contexts. Control and exclusion in tourism results in the control and exclusion of tourists and through this process injustice and inequality occurs. This is evident wherever justice and peace does not prevail. Under Burma‘s military dictatorship, in Sri Lanka and in the ethnic minority areas of China where tourism is used as a tool of occupation, justice and peace are replaced by capital and profit. In such situations, tourism is not a tool for peace, but a tool for oppression and ultimately a tool to maintain the status of those in power. The largest cause of terrorism is the absence of justice, deeply rooted in exclusion and discrimination. This might be stemming from an individual or a collective experience. Tourism might be one, if not the only path to overcome walls and be part of the lives of others. It may be a key gateway to peace. When we move beyond ‘safety’ and meet at the ‘point of suffering’, we can walk together towards true peace for all, and not just ‘security’ and ‘safety’ for ourselves. When we recognize that there will be no safety without peace, we will be able to find new solutions and ways to create peace for all and not just for a few. In order to move toward building sustainable tourism that is reliable and inclusive in all aspects and contributes to sustainable development, peaceful and inclusive societies and access to justice for all, we will need to seek the path of peace for all, a path where justice and peace embrace. All conflict, violence, occupation and dictatorship, undemocratic rule and oppression must be eliminated and tourism led by governments under any of the above must disclose all information in a transparent way. All discriminatory and exclusive systems should be abolished. Everyone should have equal access to information, the right to participate and to travel. Tourists have the right to receive accurate and comprehensive information. Distorted information and images loaded with prejudice and bias related to safety and danger should not interfere with the right of the tourist to access accurate information. Tourism is not only a mode of consumption, but a microscopic meeting place where isolated, marginalised and suffering people can be supported by international solidarity. Through tourism we can understand one another, cultivate peace, recover justice and create a better world together. The idea that travel can be educational and positively influence international affairs motivated the US-based international human rights organisation Global Exchange to organise their first ‘Reality Tour’ in 1988. Reality Tours are meant to educate participants about how people, individually and collectively, contribute to global problems, and, then, to suggest ways in which they can contribute to positive change locally and internationally. Relationship building is regarded as essential to this transformation. Global Exchange seeks to establish people-to-people ties by introducing participants to local individuals that most travellers would never meet on their own. These ties may prompt participants to examine their own societies and inspire learning, sharing and advocacy after the tour is over. The Peace Boat team believes that travel can be a tool for positive social and political change, and seeks to create and implement best practices in responsible travel. Socio-political considerations rather than commercial interests largely determine the choice of destinations. Peace Boat seeks to create awareness and action to effect positive social and political change through global educational programmes, responsible travel, cooperation projects and advocacy. These activities are carried out on a partnership basis with other civil society organizations and communities in Japan, Northeast Asia, and around the world. Jamud, Travel to Hope(2009): Interview with Maria Youngsin Lim, Imagine Peace on the possibility of justice tourism. Toubassi, M. Ministry of Tourism and Antiquities, Palestine in Alternative Tourism Group (2008): Combating Dispossession, Towards a Code of Ethics for Tourism in Palestine.